My wife and I were looking for a good, reliable vehicle. We spent a decent month conducting our search on the internet, speaking to friends, and inquiring from various dealerships. In the end, after extensive research, we decided to go with Hertz Car Sales. I called Hertz and spoke to their sales representative Frank Fayazzadeh. Frank was absolutely fantastic on the phone, did not rush anything or try to convince me to commit to anything. I told Frank about the vehicle I was looking for (2015 Toyota Corolla LE). Frank stated Hertz have the vehicle and I can come anytime to take a look. On the weekend my wife and I went to Hertz, met Frank, and looked at various vehicles, with different colours and mileage. Frank was not pushy, answered all necessary questions, let us look at vehicles at our own pace without rush. We went for a test drive on a Silver Corolla vehicle, however, we chose to try a Black Corolla that had less mileage compared to Silver Corolla. I requested Frank if we could drive the Black Corolla as well. Frank cheerfully acknowledged and provided us keys for Black Corolla. 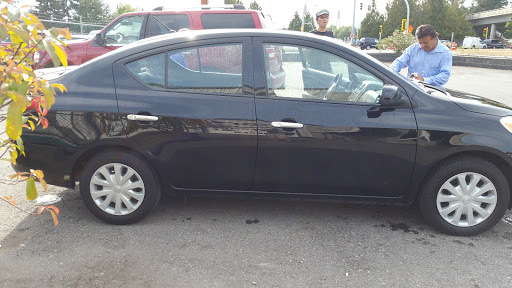 Once were were satisfied with our test drive as well as everything that we wanted in our vehicle, we decided to purchase this Black Corolla. Frank then provided Car Proof as well as explained the vehicle inspection to us. Frank then arranged for a insurance broker to get vehicle insured without any hassle. The finance manager John Boero too was very polite and professional, did not try to lure us into any salesman tactics.Overall I had really good experience with Hertz. The vehicle price was "no haggle price", they charged me exactly what was advertised. Their vehicle prices are lowest in the market for really good quality vehicles. I strongly recommend Surrey Hertz. Thank you Frank for making this vehicle purchase a very pleasant experience. Ive only owned 2 vehicles before this and both were used, and inexpensive but constant repairs spurned me to look for something newer once I could afford to do so. Friends of mine found Hertz Car Sales, and purchased a Toyota Corolla from here, from Larry. They got a great car, with extended warranty for a great deal and highly recommended Hertz and Larry- so a friend and I went in. I was nervous but the Hertz team immediately put me at ease. I had a list of their inventory printed out, narrowed down to 3-4 vehicles that were of interest, in terms of price and kms. I test drove the 14 Matrix, and quickly decided to buy it. Larry and his finance manager Valentin were cheerful, professional and lightening fast in getting the paper work and financing together for me. Larry and the sales team are low pressure, courteous and showed me all the repair documentation and history of the Matrix completely ~before getting me to start signing anything. The insurance agent took a long time which put a real damper on the whole experience- this was my first new-ish car purchase which took a VERY long time due to the agent being so busy, and arriving so late. Definitely plan on waiting for insurance/plates so you dont end up leaving exasperated like I did finally. But, after months of carefully searching, reading reviews and looking at all the other dealerships ads- I have no doubt that I got the best car at the best price and value. I couldnt be happier with my 14 Toyota Matrix- and hats off to Larry, Valentin and the team at Hertz. Definitely go have a look, youll be pleasantly surprised at their stock, prices and great value. My husband and I were initially a bit nervous about buying a rental car but our experience turned out to be extremely positive. We purchased a 2015 Toyota Sienna for thousands less than the identical model elsewhere and our sales person Frank was outstanding. Although they had the inspection report from their repair company (Midas), we had the van checked out by our Toyota dealership as well and there were no surprises except for a front wheel alignment issue that most likely happened post-inspection at Midas. Our Toyota rep said the vehicle was "gold star" and that he would have zero qualms purchasing it - very well maintained and in excellent condition. We decided to purchase, and Frank sent the vehicle for a wheel alignment and gave us the repair report for our records. He also managed to remove some stains behind the third row seating that we thought would be permanent. Additionally, I didnt realize that I left my wallet there but they called me as soon as it was discovered, locked it in their safe, and Frank delivered it to me at home. I will update this review if anything changes, but despite initial reservations I really feel that Hertz Car Sales Surrey is an overlooked gem for new-ish, reliable, well-maintained and very competitively priced used vehicles. I went around few places looking for a mini van and Valentin and Larry at Hertz Car sales surprise me by their great customer service. Both men show integrity, maturity and professionalism in their service approach. There was no sales pitch or sales pressure or give us a deposit and we talk attitude. I usually dont write reviews unless someone does something beyond their jobs. The vehicle I purchased was missing an antenna and Valentin ordered one immediately from Toyota and replaced the missing antenna. He could have just ask me to take it or leave it. I was at Langley Toyota that morning and that was what the sales manager did to me - gave me the take it or leave it attitude. What a day and night difference in customer service. The vehicle I purchase was a 2014 Toyota Sienna. Another pleasant surprise I received after the purchased was I get a week free vehicle rental in Canada or the US from Hertz for my Vacation. What else could you ask for! I will certainly recommend Valentin and Larry at Hertz Car Sales to anyone looking for a great used vehicle. After looking around everywhere me and my husband decided to come to hertz car sales and we can say we left happy! Our salesman Larry was friendly, informative, and honest. We were able to choose a car when we were there on our first visit. We liked how the cars did not have any accidents on them, as well the prices were lower then the other dealerships. We noticed that the cars were kept in excellent condition. The second time we went to pickup the care, the paper work was already drawn up, it was fast and super easy. Larry had it all out for us and had told us beforehand what to bring, and the insurance broker was already there too, so we were pretty much in and out! Cant say I would have a better experience then this anywhere else. We would highly recommend this place to anyway looking for a used car. My experience at Hertz was phenomenal! Larry was incredibly nice and helpful, and he actually made sure I liked the car I was buying, instead of pressuring me to buy. I ended up getting a 2015 Hyundai Accent that is in great condition and has low miles. John assisted me with financing and was really informative and didnt take advantage of my lack of experience in buying and financing a car. We had to wait a few days for my application to finance to be apply, but the team communicated well and checked in with me so I knew I wasnt forgotten. When we went to sign papers and pick it up, Valentin assisted us, and was just as friendly and helpful as Larry and John had been. Overall, it was a very positive experience. I highly recommend Hertz if you are looking to buy a car.